Come enjoy a magical evening with friends while raising awareness for a wonderful cause at this year’s Opening Doors Gala. 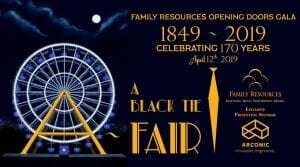 Family Resources’ largest event of the year, the 2019 Opening Doors Gala: A Black Tie A-Fair, takes place on Friday Apr 12 from 6-9 p.m. at the Quad Cities Waterfront Convention Center (2021 State Street Bettendorf). Enjoy a fantastic evening featuring a cocktail hour, live entertainment, dinner and program, and silent and live auctions. Returning again will be Magician David Casas, joined by the one and only Juggling Zach Metzler. Guests will also enjoy the soothing sounds of vocalist Freddy Allen. Entertainment will be provided all evening by special guests emcee, Decker Ploehn. Cocktail hour and silent auction begin at 6 p.m., dinner and live auction will begin at 7:30 p.m.
An individual dinner reservation for this amazing event is only $85 and an entire reserved table is only $650. Reservations can be made online. Family Resources provides services to children, families and individuals in Iowa and Illinois. By attending this gala, you are ensuring the continuation of crucial services such as emergency housing, counseling and education. For sponsorship opportunities, please contact Family Resources’ development director, Nisha Ladlee, at nladlee@famres.org or (563) 468-2140. Experience the magic this Friday at the 2019 Opening Doors Gala!